“Silver Metcar Material for Electrical Contacts and Brushes” refers to the silver-impregnated carbon/graphite materials Metcar produces for electrical applications. 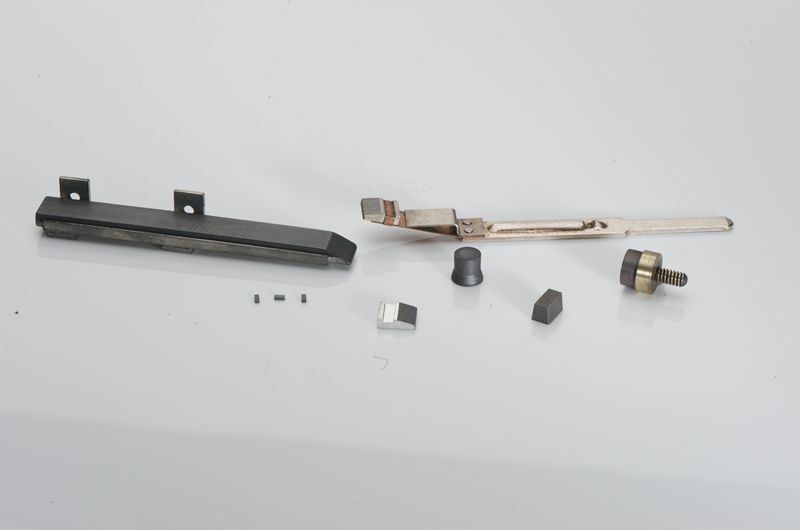 These materials are solid carbon/graphite based impregnated with molten silver into a controlled amount of interconnected porosity. Silver contents from 25-90% by weight are available. The carbon/graphite substrate provides the self-lubricating properties, while the pure silver provides high and constant electrical conductivity. Additives to the carbon/graphite base material are made to improve the self-lubricating properties of the material in dry atmospheres that occur at high altitude and in space applications. Silver Metcar will not melt or weld to another metal surface because the carbon/graphite base material will not melt. Silver Metcar can be silver-or copper-plated for easy solderability to metal parts such as leaf springs or conventional brush holders, and is ideal for DC motor brushes, non-welding electrical contacts, and rotary slip ring brushes or contacts. We supply brush and contact tips made from Silver Metcar materials. These tips can be machined to customer specifications and they are available with or without silver plating. Most Silver Metcar brush tips and contact tips are purchased by manufactures of low noise slip ring assemblies, non-welding contact assemblies, and high-altitude DC electric motors. Metallized Carbon Corporations technical staff can recommend the optimal Metcar grade. Low-noise slip ring assemblies are used to transmit minute electrical signals in rotating equipment like microwave antennas, radar receivers, sonar receivers, rotating thermocouple read-outs, and rotating strain gauge read-outs. The slip ring is attached to the rotating shaft and is usually made of coin silver, silver-plated copper, or bronze. 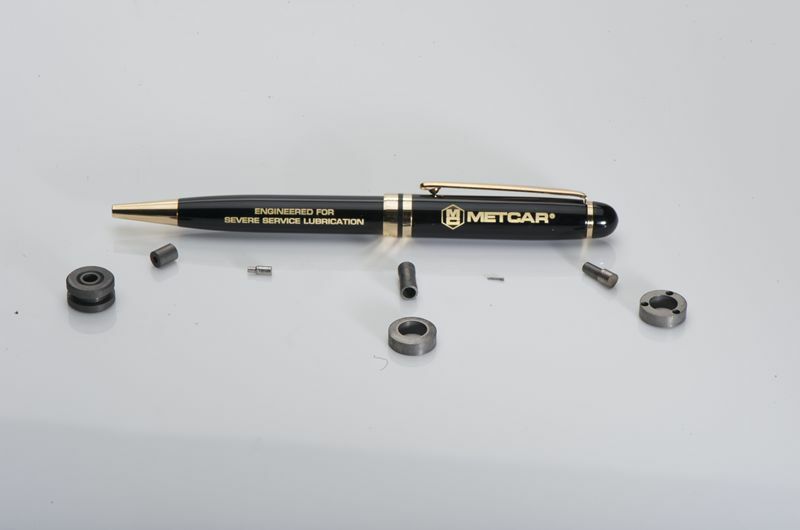 If a connection with low resistance, low voltage drop, and low electrical noise is required, the stationary brush or contact can be made of Silver Metcar. These assemblies are also called rotary joints, microwave rotary couplings, and RF rotary joints. Applications include air traffic control radar, telecommunications systems, and satellite communication systems. A noise level a low as 0.01 mv is possible on a 5 mv signal. Rotating shaft speeds can be as high as 10,000 ft/min. Silver Metcar non-welding contact tips are used to interrupt critical circuits where there is the possibility that heavy overload could cause other contact materials to arc and weld in the closed position. This situation occurs in circuit breakers, controllers, contactors, and relays due to possible short circuits or lightning strikes. Silver Metcar is also good for sliding contacts where long wear-life and low contact resistance is required. This occurs in elevator contacts where high amperage circuits must be reliably opened and closed. Ordinary carbon/graphite brushes show a high wear rate when running at high altitude (over 20,000 ft), in vacuum, or in dry atmospheres (dew point -30°F, or -34°C). However, Silver Metcar brushes with additive film formers can run on coin silver, silver, copper, or bronze commutators and provide long wear-life, low voltage drop and high current carrying capacity.